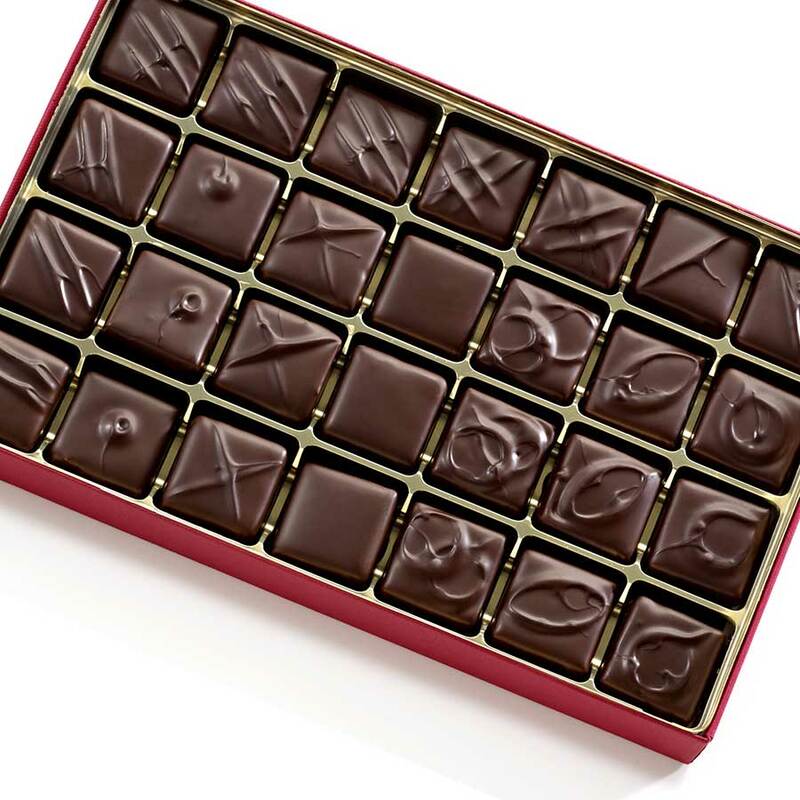 This 28-piece chocolate box is our most popular gift and features all ten of our award winning flavors. To make them, we infuse real herbs and spices into fresh cream, such as just picked garden mint or fresh young ginger from the island of Molokai in Hawaii. The infused cream is then heated and poured over amazingly complex Valrhona milk or dark chocolate and mixed until a super creamy ganache is achieved. The ganache is then poured into a frame, allowed to set for 48 hours, and cut into one and a quarter inch squares. Finally, each delicate square is enrobed in a thin layer of 62% dark Valrhona chocolate and marked by hand with a fork. 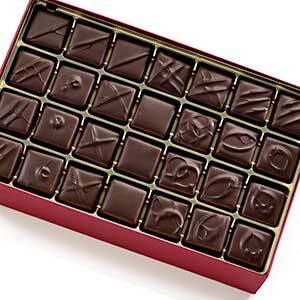 Chocolate squares filled with ganache in all of our 10 signature flavors. Hands down the best candy I've ever eaten! This candy has ruined me for all others. Once you try a piece of John & Kira's all others will pale in comparison. The every piece collection features the perfect blend of flavors and delicious chocolate. 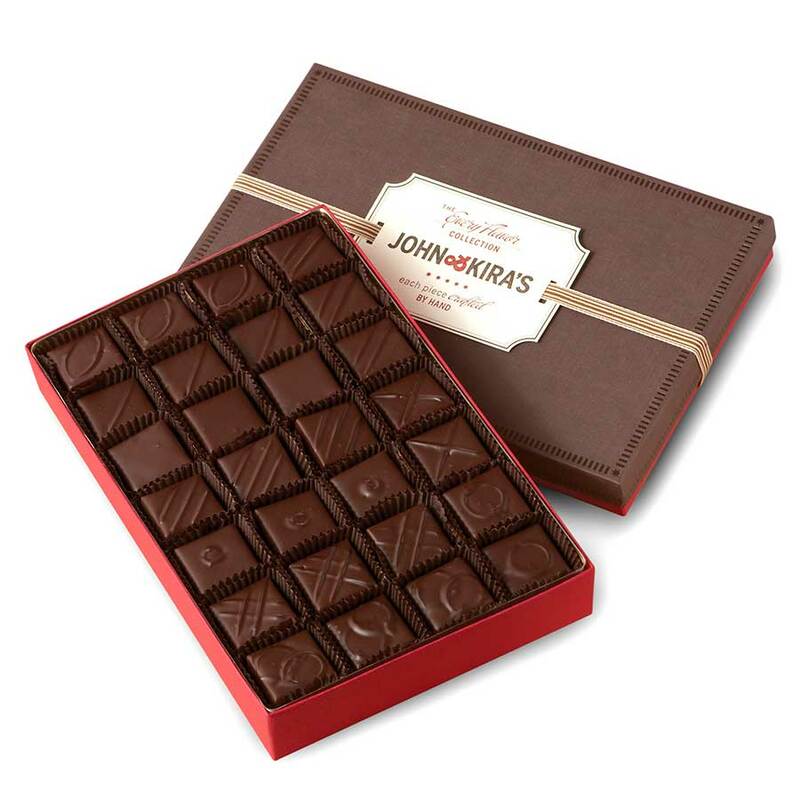 Trust me when I tell you that you'll want to hide the box so you can savor each bite of pure deliciousness yourself! Ever since I brought home a box as Christmas present for my parents, they have been asking for it every year, not just for themselves but their best friends. The flavour is very pure and the ingredients speak for themselves. Very good value for such high quality chocolate. I have tasted chocolates the world round, yet I have found few truffles that have such unique and vibrant ganaches as the Everything Collection. The creative combination of ingredients is each of these pieces is worthy of slow examination. The flavors are subtle, but very satisfying. The chocolates are smooth and the perfect size, just the right bite! Some of the best chocolates I have enjoyed. Whether we order the every flavor assortment for ourselves, as a hostess gift, Mother's Day or birthdays, no one is ever disappointed. 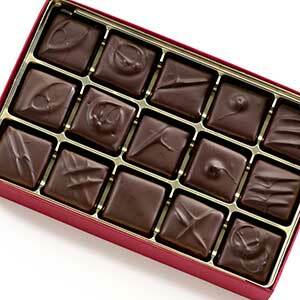 little beautiful squares of amazing flavor and so so so elegant. Its impossible to eat just one but they make an amazing treat. I send this box to clients and business contacts throughout the year and it always meets with rave reviews. We've tried so many "fancy" chocolates and this is still our favorite after many, many years. The taste is so unique and the quality is fabulous. It 's a bit expensive so we savor each piece and only get it on special occasions. It is such a treat though. Take it from a true chocoholic, the taste in each bite is outstanding! Really fresh and smooth. These chocolates are luscious!! Good choice of flavors, something for everyone. The only thing that would make them better is if the flavors could be ordered individually - imagine a whole box of fruit flavors, or tea flavors - yum. You won't be disappointed! I've been loving these chocolates and giving them to friends, family, and clients for over 15 years. I'll be perfectly honest, my very favorite flavor is no longer in the box (pistachio) however, all the flavors are amazing!!! Owner Response: Your honesty is welcome! The pistachio has always been incredible - and it is still available in our Sweethearts box, plus we've added a rich pistachio praline to our Winter Snowflakes as well as our Hearts and Butterflies box. We DO hope you'll find yourself enjoying the new Passionfruit Ganache enough to make up for the change. Divine elixir! Being a fruit and chocolate lover I thought my favorite was Glenn's Raspberry, but then discovered each one held it's own magic. A special friend just shared his box of Every Flavor with me .Lets just say that ise the quality speaks for itself. Thank you to John and Kira's for preserving taste! These chocolates are excellent, and are of such a high quality - what a rare treat these days :). I can ALWAYS count on John and Kira's for gifts and for myself! I'm a big fan of the 28 piece box and i also think the chocolate covered cherries are just amazing! I know my artisanal chocolate and John and Kira's are JUST OUTSTANDING and EVERYONE RAVES about them all. You will NEVER eat ANY other chocolate again!! My husband came home one night with John & Kira's and I had to hand him the box and tell him to hide it from me or I'm eating them all. Cross my heart, he had to do that because this is the most amazing chocolate EVER!!! Nothing compares to John & Kira's. Your the best!!! These chocolates are fantastic!! They are creamy, and are infused with the most fabulous flavors. Your chocolates are a flavorful sensation. I give these chocolates as a gift I know will for sure wow the recipient year after year. I also give the chocolate covered cherries. Just exquisite! Plus they ALWAYS arrive on time, in perfect condition even in the middle of the summer! Thank you John and Kira for you exceptional work. Absolutely heavenly! Both the chocolate cover and the fillings. I've tried lots of chocolate from all over the world... But J&K is by far my absolute favorite! 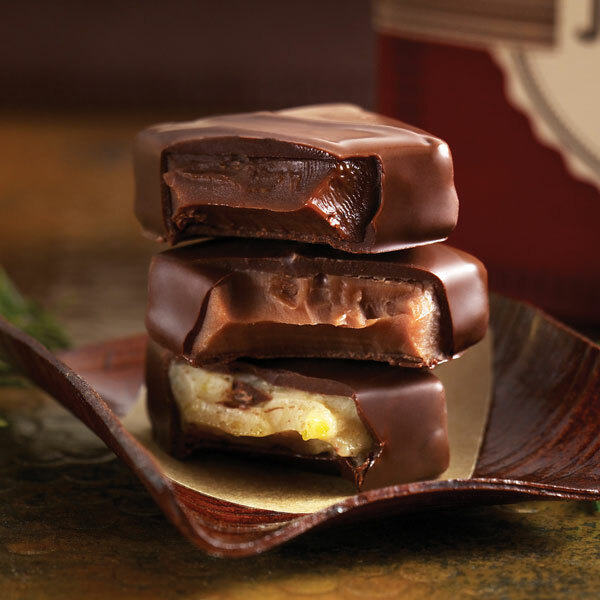 Nothing compares to the fresh handmade chocolate squares filled with carefully picked ingredients. Highly recommend! 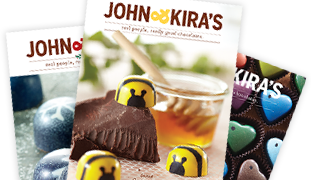 Was pleasantly surprised when I tasted John&Kira's chocolates. You can actually taste the ingredients. My husband doesn't even like chocolates that much and he loved them too. Awsome! Right up there with the best I've had. I was introduced to these chocolates as a gift from my daughter. They are FABULOUS! I now give them as gifts to MY friends and family. (I LOVE when UPS knocks on MY door with a box from John and Kira's!) They are absolutely WONDERFUL! 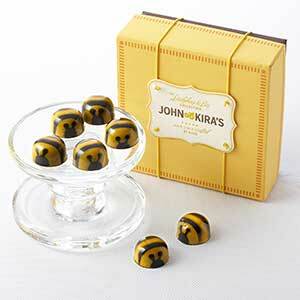 The candies are excellent and the packaging is very classy. The "Every Flavour" collection is my favorite. In addition to the unique flavors, the story behind the making of these fine chocolates--Glenn's garden and the outreach to other global areas--also makes them very special and worth sharing with others! May the making of these fine chocolates and the story behind them continue. Love those chocolates!!! Some of the best candy I ever put into my mouth.